While instrumental music in the overarching realms of rock and metal over the past decade or so has given birth to some truly phenomenal bands, it's easy to cave by classifying these bands as simply "instrumental". If you asked a metal fan who some of their favorite instrumental bands are, it might not be a surprise to hear them mention bands as stylistically divergent as Animals As Leaders and Explosions in the Sky in the same breath. One band which has woven a unique patch in this instrumental tapestry, however, is Scale the Summit. The band's technical prowess blended with warm and organic rhythms has cemented them a spot in the upper echelon of the current progressive metal scene. 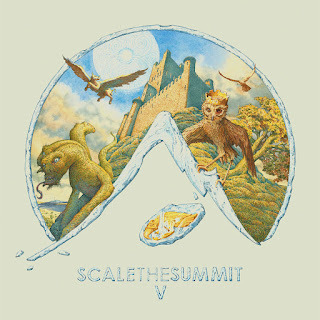 Without fail, Scale the Summit reveals a new depth of complexity and honing of craft with each release. SPOILER ALERT: Their newest release, V, is the band's fifth album (shocker), which takes the listener through familiar, yet welcome territory. Like a mixing pot with their four previous albums thrown in, V represents a cumulative pinnacle for Scale the Summit. My favorite track off the album, "The Winged Bull", also happens to be the opener. With a simple soft guitar riff, the track builds and blossoms into a flurry of solos and grooves that are best enjoyed at your audio system's max volume, especially if it goes to 11. The second track, "Soria Moria", features smooth, free-flowing guitar lines reminiscent of a track like "The Levitated" from their third album, The Collective. Subsequent tracks that make the meat of the album follow a similar pattern. Ambient sections of clean reverberating guitars are evenly balanced with heavy breakdowns and solos that all flow together so effortlessly it makes for an easy but rewarding listen. If you were hoping for some mind-numbingly fast solos, though, fear not. The album's last half is full of them. From tracks like "The Isle of Mull" or "Kestral", there are tons of opportunities to give your air-guitar chops plenty of practice. The overall tonality of V not only makes this album stand out from the band's previous albums, but even more so is a testament to the harmony achieved between all the band members. The collaboration of Travis LeVrier and Chris Letchford continues to astound, providing both technically masterful solos and entrancing harmonies, both of which serve as the album's life-force. Whether it's blisteringly fast sweeps, tapping, harmonics, and elongated notes that seem to take on a triumphant life of their own, every solo style under the sun is utilized to create passages that travel from your ears to your brain and set up camp there. Newly added drummer J.C. Bryan and returning bassist Mark Michell certainly don't take a back seat to these two, though. Michell especially proves on tracks like "Oort Cloud," featuring a staccato groove, that the bass is no joke of an instrument and he's no slouch either. The end product is music that may switch gears from extremely fast to extremely slow, or vice-versa, on a dime. The album always manages to maintain a rigid structure, that on paper might seem daunting, but the result is an effortless and engaging listen. It's a minor gripe, but if I had to split hairs on V it would be that there's no clear stand-out track on the album. The Migration had "Atlas Novus" and The Collective had "Whales" but V doesn't have that clear-cut single. The bigger upside to this, though, is that it allows the experience of the album as a whole to shine through. While this is far from a concept album, it forces the listener to kick back and enjoy the album as a greater listening experience as opposed to track-by-track. Asserting that a band has gotten objectively better with each release is a notion that I try to vet to the nth degree before stating. With V, however, it's hard to deny what Scale the Summit has achieved. They've managed to simultaneously keep true to their sound but also push their own sonic boundaries. Pardon the pun, but if this band hasn't reached the summit yet, it's clear that they are still scaling it.